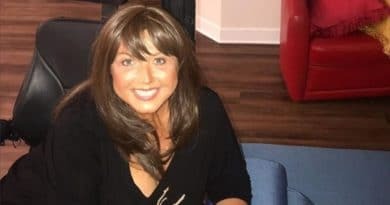 Dance Moms fallen star Abby Lee Miller appears to be returning to the Lifetime show as she posted up about it on Instagram. Fans know she’s had a challenging time. After her release from prison, she entered into treatment for cancer (Burkitt’s lymphoma) and spends her time in a wheelchair. Abby announced she’s back and filming and posted a photo on Instagram. Judging from the photo, she looks to be on the set of Dance Moms. That’s great news for those who love her, but her next photo (November 7), was deeply disturbing. In fact, many followers felt confused and couldn’t understand what was going on. In her first Instagram post about the filming, she used the hashtag #dancemoms, so everyone’s assuming that’s the show she’s filming. Sitting in her wheelchair she looked happy and demure. Her leopard print shirt suits her and it’s obvious that this is a very different Abby Lee Miller than we remember from the last time we saw her on TV. (Or so we thought). She looks older, thinner and a bit tired. Not surprising, after her hellish battle with cancer. However, it was the next photo that grabbed people’s attention. It could be a photo regretted and taken down one day. Several followers suggested the need to take it down because they felt it shouldn’t be on social media. Other Dance Mom fans think it’s just Abby Lee having some fun. Abby Lee Miller must be aware that her Instagram post about filming again would get thousands of people flocking to her account. Lots of other Dance Mom followers also admitted to confusion. Some of them didn’t understand what they were seeing. Others couldn’t understand the birthing position, with two people holding her legs apart and up in the air. Meanwhile, others questioned the angle of the camera facing her. How come someone faced her private area? Most of all, people questioned why a flashlight shone in her groin. They couldn’t get it, and one follower, Lillygirl1031, said what lots of others thought: “…why’d she have to post it like that. It’s kinda inappropriate and disturbing.” In fact, this came after another follower said she needed help to get dressed. Abby Lee Miller’s bizarre moments go back some years and some fans of Dance Moms noted that as well. However, it seems this latest photo’s possibly the weirdest thing. What do you think was going on? Do you find the photo disturbing? Stay in touch with news about Dance Moms by checking in with Soap Dirt often.